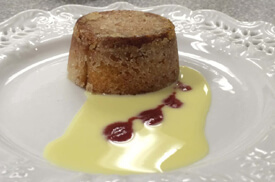 This apple “Charlotte” recipe was created by Chef Jean Louis Palladin. He was inspired by the classic French dessert, “La Charlotte aux Pommes.” You will be amazed at what you can do with a slice of bread, some butter, and a beautiful apple. This class also includes instruction on Flounder Paupiette with White Wine Cream Sauce!